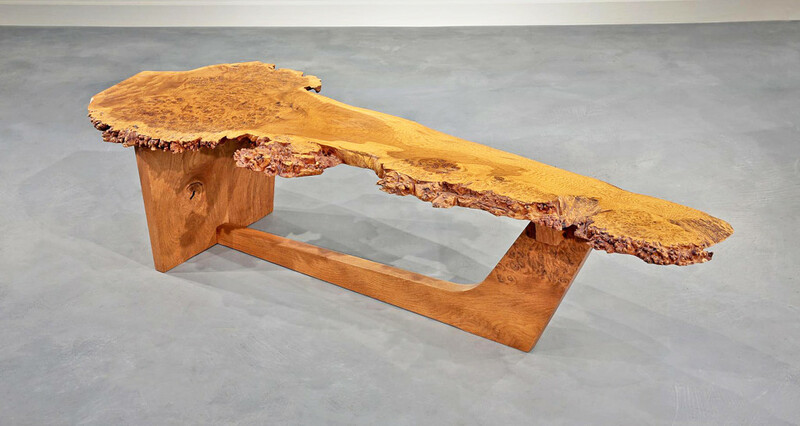 A sled-based coffee table by New Hope furniture maker George Nakashima will be on offer from Moderne Gallery, Philadelphia. 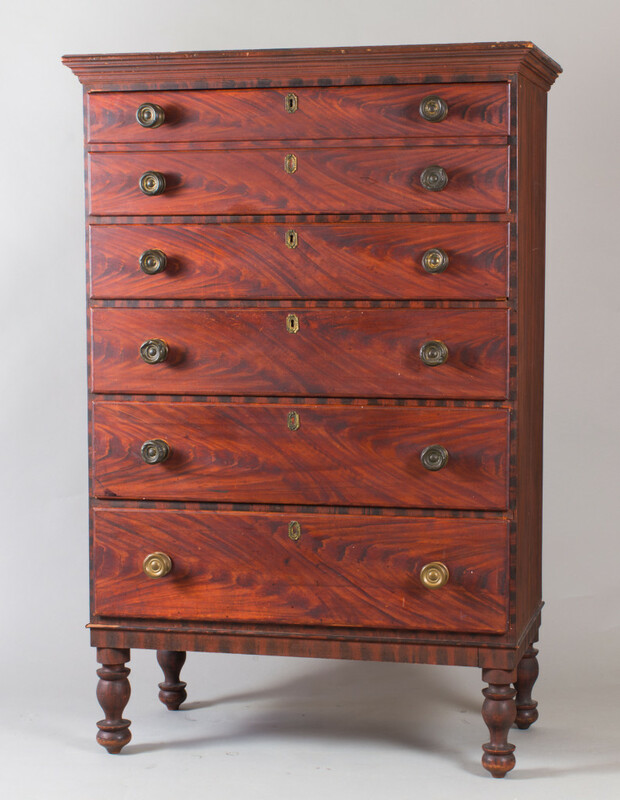 PHILADELPHIA — Continuing its efforts to broaden the range of material on offer, the Philadelphia Antiques & Art Show will dance to a different tune for its April 20–22 edition this year. Once a bastion of fine, traditional antiques and art from America and Europe, the show has announced that it will broaden the material on its show floor, accepting and encouraging decorative and fine art and design from Twentieth Century and living artists. And whether artists throughout history will admit it, they are not exempt from the fact that every maker, now and past, stands on the shoulders of giants. And with that, the show has permitted dealers to bring up to 25 percent of their material from living artists. Datelines are secondary to originality and quality, attributes that have found safe haven in the current collecting climate. 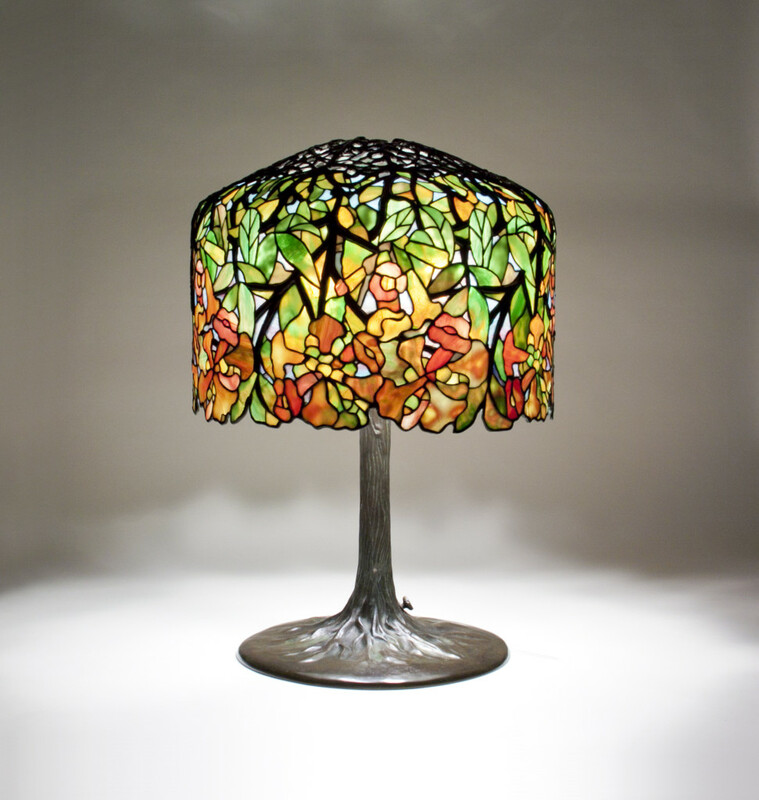 Lillian Nassau, New York City, will offer a Tiffany Studios leaded glass Trumpet Creeper lamp with Tree Trunk bronze table base. After many years away, Twentieth Century design will return to the fair with the inclusion of Philadelphia-native Moderne Gallery. Founder and co-director Robert Aibel will feature works by George Nakashima, Wharton Esherick, David Ebner and Harry Bertoia alongside ceramics by Estelle Halper, Ira Winarsky and Karima Duchamp. This year’s edition adds another beneficiary to the show’s fundraising efforts, including the Philadelphia Museum of Art for the first time alongside Penn Medicine. The museum will mount the loan exhibit “Philadelphia Collects Philadelphia,” which will feature the work of historic and contemporary Philadelphia furniture makers and fine and decorative artists as well as porcelain and silver items from the museum’s collection. The show is delighted to offer a program schedule that will please collectors, academics and horticulturists. To pop the cork, the show begins with a preview party on Thursday, April 19, from 6 to 9 pm with early admission beginning at 5 pm. Martha Stewart will kick off the scheduled events on Friday, April 20, with her “Martha’s Flowers” talk at 11:30 am. Stewart and her co-author Kevin Sharkey are promoting her latest book, Martha’s Flowers: A Practical Guide to Growing, Gathering and Enjoying, and will discuss when to plant, nurture and, at the right time, cut from your garden. At 2 pm the same day, Philadelphia Museum of Art curators Alexandra Kirtley and Elisabeth Agro will present “Collecting Philadelphia: A Legacy of Art,” speaking on the significance of Philadelphia-native features like form, material and ornament that have spanned generations of artistic tradition in the City of Brotherly Love. Friday events are capped off with the 8 pm ADA Award of Merit dinner, which will honor Peter Kenny, co-president of the Classical American Homes Preservation Trust. Two events on Saturday, April 21, continue the programming through the weekend. At 2 pm, Emelie Gevalt, PhD candidate at the University of Delaware, will present “Buying and Selling Philadelphia: The Story of the Legendary 1929 Reifsnyder Sale,” which will explore the market forces, personalities and powerful mystique behind the sale of Howard Reifsnyder’s Philadelphia furniture collection. From 6 to 8 that evening, the show will sponsor “A Special Evening of Collecting & Cocktails For Emerging Collectors,” allowing a more intimate environment for those who are new to the field and offering them more one-on-one time with dealers and experts. Programming will finish up on Sunday, April 22, at 2 pm, with a presentation from Stacey C. Peeples, curator-lead archivist at Pennsylvania Hospital. The talk, titled “The Pennsylvania Hospital and Its Historic Collections: Living History,” offers a perspective into the preservation and restoration of the hospital’s collections and touches on the unique position of working in an historic building and providing tours, while balancing the fact it is used for modern hospital business. Each day from 10 to 11 am, Philadelphia Museum of Art Park House guides will offer guided tours through the show, highlighting notable objects and art, while taking a closer look at the 2018 loan exhibit. Karen DiSaia is confident in the show’s direction as she sees firsthand an audience that still desires to learn from objects and art. “Through the show and the loan exhibit, visitors will experience timeless great design,” said DiSaia. “Colonial-era pieces will be presented alongside midcentury ones, and you will be able to see the connections between the two,” she said. The Philadelphia Antiques and Art Show will be held at Philadelphia’s Navy Yard at the intersection of South 11th Street and Kittyhawk Avenue. For more information, www.philadelphiaantiquesandartshow.com or 215-763-8100.